Nearly two weeks into January and I suspect most of us have long since abandoned our New Year’s resolutions. Yeah, I’ve been slow to hit the treadmill too. The cold weather and holiday lures many motorcycle riders into snacking more and with that often comes a little extra weight. 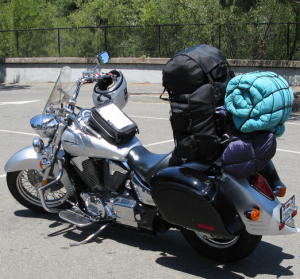 Come spring riding season we’ll jump on the motorcycle… add helmets, rain gear, sleeping bag, food, and clothing along with a duffle bag of camping gear to the bike and unknowingly may have overloaded it. Many riders don’t give weight limits or baggage much thought. We’ve seen them… cruising down the road with multiple bungee straps holding their leaning cargo… a disaster in the making. Of course the real danger is weight limits can contribute to tire failure. Like all motor vehicles, motorcycles are manufactured to specific weight limits, but it’s not always easy to figure out the correct limits. Lucky for us the Edwards legal firm, pulled together a web site which provides quick and easy weight calculations for Harley-Davidson and other cruiser motorcycles. It’s a unique marketing tool disguised as customer advice. They are at the end of the day in the business of providing legal representation should you need it, but the weight calculator serves a very useful purpose. If you’re old school and want to reference the Owner’s Manual fine. However, many owners’ manuals including Harley-Davidson’s only list the bike’s Gross Vehicle Weight Rating (GVWR). So, you’ll need to calculate what weight is available for passengers, gear and fuel. It’s a little challenging, but find the motorcycle’s “as-shipped weight,” also known as “dry weight.” This is the bike’s weight alone, not including gas and other liquids. Sometimes, weight is expressed as “wet weight,” which is the weight of the bike plus all liquids. If there is no “wet weight” specified, it’s suggested to add 50 pounds to the “dry weight” (a gallon of gas weighs about six pounds plus other fluids). Subtract the motorcycle’s “wet weight” from the GVWR. The result is the maximum amount of weight you can put on the bike, including passengers. I found the site rather interesting especially when comparing the differences in weight capability of the new H-D touring chassis/frame which was introduced on 2009 models vs. my older ride. It is indeed heartening to see that Harley is making note of changing rider weight requirements. We recommend that potential Harley buyers not be fooled by thinking the “bigger looking” bike carries more weight, when all those accessories actually take up more weight. It’s always best to check out the statistics, or ask the dealer (who may or may not know himself without looking it up in the owner’s manual!). Thanks for letting your members know about the Safe Weight Calculator.